This year’s edition of the Graduate Symposium in the Department of Education was a huge success thanks to you. The overall quality of presentations was exceptionally high. The presentations were engaging, the topics discussed were diverse, and the atmosphere was buzzing. The symposium welcomed a record number of attendees for a full day of talks and posters with the overarching theme of education for empowerment. The GSDE 2019 highlights focused on the following topics: LGBTQ+ & women (of colour) empowerment, mental health, students with special needs, issues of indigenousness, L2 (ESL) education, and international education. We would like to thank the students, professors, community members, and, of course, our invaluable sponsors for supporting the symposium. The GSDE 2019 Organizing Committee. GSDE 2019 is finally here! If are interested in watching the live stream of the presentations, feel free to access them on our YouTube channel. The registration to attend the 2019 Graduate Symposium for the Department of Education is now closed. We appreciate all of the interest and we hope everyone has a fantastic time! The schedule for the Graduate Symposium in the Department of Education is out! 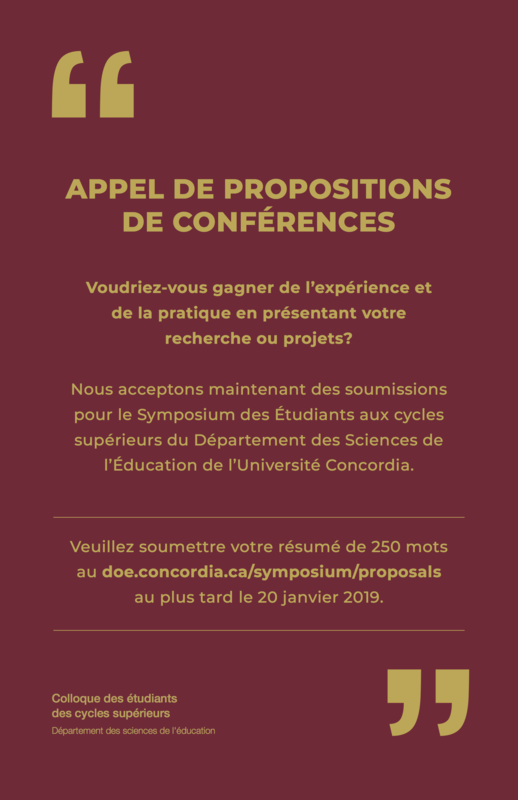 For more information, please visit: https://doe.concordia.ca/symposium/schedule/. 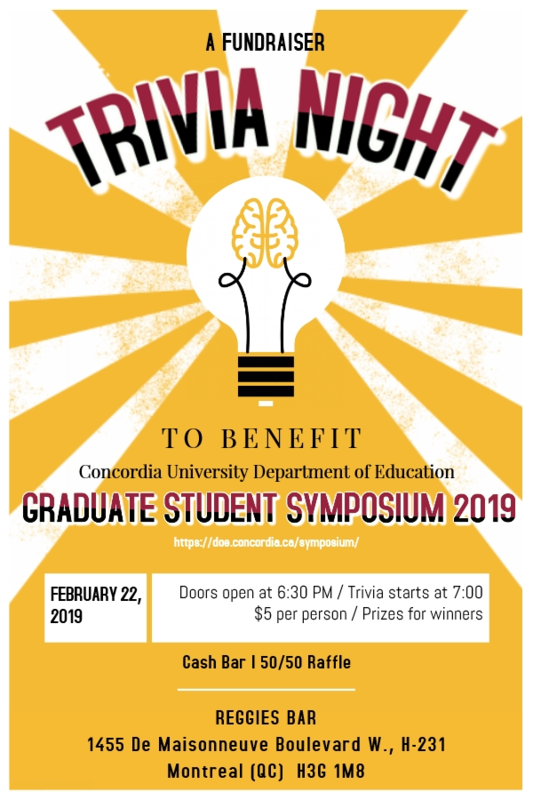 We are super excited to officially announce the Trivia Night Fundraiser for the 2019 Graduate Symposium in the Department of Education! Grab your friends and come out to Reggies, where tickets are $5 each and can be purchased here or at the door! Questions will consist of “Name that Tune”, “Iconic TV Shows”, “General Knowledge” and “Pop Culture” and there will be prizes for the first and second place teams! PLEASE BUY YOUR TICKETS IN ADVANCE – SPACES ARE LIMITED!! Drop-ins are also welcome, space permitting! If you don’t have a team, no worries – we will help place you on one! The GSDE 2019 received a record number of submissions! Thank you for your enthusiasm for participating in our event. We are diligently working to review each and every proposal (blinded review). Presenters will be notified by the end of February 2019. Please note that our extended deadline to submit a proposal was January 27, 2019. We are currently in the process of reviewing the submitted proposals and we will be reaching out to all applicants with an answer shortly. The deadline for the submission of proposals has been extended for one week, until January 27, 2019 at 23:59. Find out more and submit your proposal here. 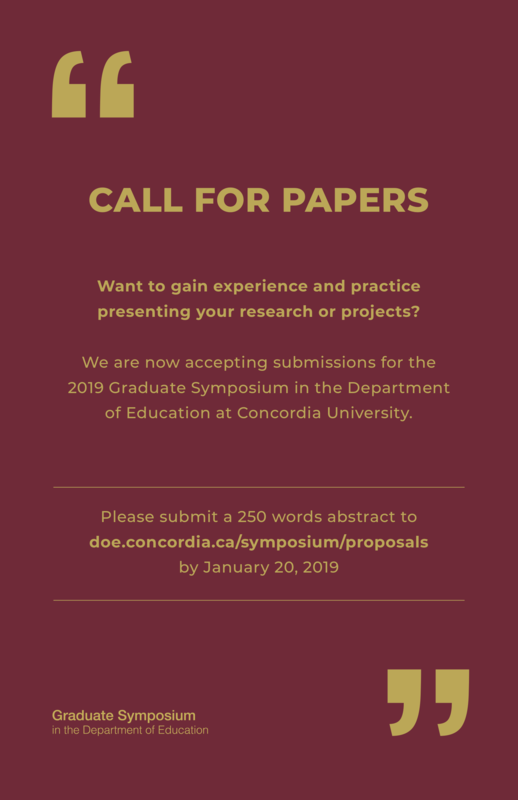 For any additional information, please contact us at gsde.doe@concordia.ca. The deadline for the submission of proposals has been announced as being January 20, 2019. Find out more and submit your proposal. If you have any questions, please contact us at gsde.doe@concordia.ca. Please join our fundraising campaign and be part of our joint effort into making this year's Symposium a memorable one. Copyright © 2019 DOE Graduate Symposium – 2019 – Powered by Customify.